Turkmenistan is a desert country situated in Central Asia. Bordered by the Caspian Sea, Iran, Uzbekistan, Afghanistan and Kazakhstan, this country was once part of the Soviet Republic. Since its independence in 1991, the country has remained isolated and impoverished. 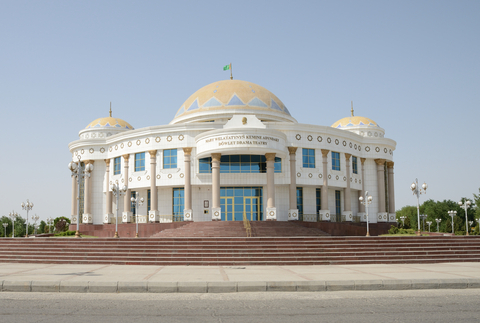 Turkmenistan has rich natural gas reserves, but corrupt government leaders have kept most of the wealth for themselves. People here lack basic resources, such as health care and education. 5.1 million people live in Turkmenistan. Turkmenistan has 188,456 square miles of land. Arabic and Kurdish are the official languages. The life expectancy in Turkmenistan is 59 years. Visit National Geographic to learn more about Turkmenistan . Question: Does Turkmenistan have ethnic conflicts like many other countries in the region? Answer: Turkmenistan still has a nomadic tribal culture, but the people are peaceful for the most part. Declan, Tobin. " Fun Turkmenistan facts for kids ." Easy Science for Kids, Apr 2019. Web. 24 Apr 2019. < https://easyscienceforkids.com/turkmenistan/ >.